RI Narragansett Bay Archipelago Rally!? (Newport, RI)- A Rhode Island ‘classic’ comfortably reaches ‘annual’ status. It was 2006 when Olympic silver Medalist Bob Merrick won the inaugural Archipelago Rally on a beat up Hobie 14 by a mere 30 seconds over windsurfing champion Nancy Johnson. That first weekend in December was thrown together the week before with a few phone calls and emails and with a 20-25-knot Westerly, about a dozen “craft” raced, slowest starting first, to Spar Island, a scrubby little sand bar in the middle of Mt. Hope Bay in the middle of Narangansett Bay. “The only thing we expected about his year’s Archipelago Rally was having a fantastic time on the water. The unexpected was the icing on the cake at Quonochontaug Pond with aqua-marine colored water and white sand shoals the size of football fields, there was a lot of walking of boats and damaged rudders and centerboards but nothing could dampen the Rally spirit! The highlights this year weren’t that there were thirty-five craft and more than forty kids sailing or that the breeze and bright sun made for a spectacular venue. I would say the main takeaway was the fact that two young girls were second and third and that a windsurfer won for the first time in the eight year history of the event. The third place girl miraculously has placed in the top five each time she has competed! Video by Annie Tuthill, who has yet to miss a rally. (San Juan, WA)- 89 boats made it out for Orcas Island’s annual romp around the San Juan Islands, well they made it out and a few made it around, some almost made it, and most just didn’t have a chance. Boats began their deliveries as early as Wednesday, some chose the rippin’ southerly on Thursday to make the trip, with Here & Now breaking their boom on the way up, and a large group made the trip in the sedate conditions on Friday. Beginning what for many is a four day marathon – delivery on Friday (often a 50 mile delivery), head out at O-dark-thirty Saturday to get to the starting area and then the 34 mile sail from Lydia Shoals to Roche Harbor, head out just after sun up Sunday for the 31.4 mile sail back to the finish inboard of the Lydia Shoals Buoy, then deliver back home on Monday. What seems like a short race around the San Juan’s quickly develops into over 200 miles of deliveries and racing in what is usually 40 to 45 degree fall weather – yet still 89 boats made it out to race. The current was flying at the start on Saturday. The fleet had winds out of the North but with a current of 3 knots heading into the wind the boats had some good power heading off the starting line. The problem became holding position before the start, timing it just right and spinning around at precisely the correct moment to fly across the line with the current. 34 boats in the first start barely making headway against the current on the non-course side then spinning around and charging towards the start with really no way to bail out if things went wrong. Inevitably some spun too early and with 6 boats OCS the race committee decided to call a general recall instead of naming the boats that were over early. Everyone spun around as quick as they could, fired up their motors and began the long slog against the current to get back across the line for another try. 20 minutes later they tried again and this time the RC let ‘em go, but that 20 minutes became a huge loss on a day that had a large group of boats not make the halfway point at Patos, 8 boats missing the time limit by just 5 minutes or less. Muffin quickly charged into the lead after the start and worked a bit East before heading North around the Pea Pods - looking great, but as they approached Orcas the wind just crapped out and it became painfully apparent that the further East you went towards Lummi the more wind you had. More wind, but not much wind, and with this information Here & Now, More Uff Da, and Chinook worked well up the course on the right before the faster boats began catching up and working through the early starters. Dragon Fly, of course, defied the logic of the right and worked through low along Orcas and Clark with Neptunes Car, Wasabi & Flash hot on their transoms. Eventually, though, it became a race against the clock in the light air, and since the tide waits for no man, the current eventually went against the majority of the fleet and spun them every which way. Boats that had made it past Sucia and up to the South end of Patos without rounding Alden Point got swept back with the change in tides. Some scooted through the large gap between the islands and began the slow slog up into the eddy below Patos but Bravo Zulu & More Uff Da were lucky enough (thick sarcasm) to find the river along the North end of Sucia Island. The current sucked their transoms closer and closer to the island until they were just feet away and charging sideways towards the west at over 2 knots – testing their nerves to the point that motors were readied and eventually fired up and engaged on both boats to avoid ripping the rudder off on the jagged cliff wall - An exciting few minutes for the two adrift boats. Bravo Zulu decided to throw in the towel here but More Uff Da killed their motor after one boat length and kept racing, but in the end missed the halfway point by 5 minutes. Soon after the excitement along Sucia, the Northerly finally filled in and everyone worked their damnedest to make Alden Point before 4pm. Chinook almost made it, missing it by just over 30 seconds with Por Favor just behind them. The RC could be seen packing things up on shore as boat after boat sailed around the point and aimed their bows towards Roche and another 2 hour delivery to the marina. The party tent was hoppin’ and bouncin’ as everyone arrived at the marina, most well after dark and with a break in the live music the short list of finishers was rattled off, and I mean short list. One boat made the full course finish in the Multi-hull class and only 2 boats made the halfway point. The IRC division had 6 of 10 boats making it to the full course finish with Wasabi crossing the line first at 5:08:47pm. Division 0 had 1 boat finish the long course, The Farr 395 Ace, finishing with less than 5 minutes left on the time limit. 11 of the 20 in Division 0 made the halfway point. Division 1 had just one boat make the halfway point, the Express 37 Ptolemy. Division 2 also had just one boat make the halfway point before time ran out at 4pm, the 30/30 Blackout. The 16 boats in Division 3 didn’t have enough steam to make it to the halfway point by 4pm, many missing it by less than 5 minutes – that over early call really came back to bite them at Alden Point. Sunday was different, the racers had wind, the current didn’t seem too bad and off everyone went from the start line near Snug Harbor. Boats shot out into the lead by working down the shore of San Juan Island, with Madame Pelle & Muffin leading the way. The closer you got the better you did. Although the big benefit was in making it to the Canadian shore from the starting area and then joining the incoming tide in the straits, but most of the early starters simply didn’t have the boat speed to cross the current and get to the huge benefit that Martha & Por Favor caught by working west. The bail out point on shore was obviously Lime Kiln Point. Every boat that bailed off the shore there and headed west made out huge, if you made a few more jibes along the shore you got stuck in the way back machine watching your competition pin wheel around you towards Cattle Point. Still sailing along downwind, the racers had to make a serious tactical decision passing the South end of the islands. Follow the rules in the SI’s and sail within ½ mile of Iceberg Point so their halfway time could be scored while setting themselves up in light air and adverse current, or ignore the SI’s and stay well offshore in favorable current and breeze, ignoring the halfway time and hoping to make the full course finish. A tough gamble at the time, although in the end it didn’t matter for those fleets that used the halfway times as the RC decided to score everyone no matter how far offshore they were. The leaders in the IRC & Multi-hull divisions got around Davidson Rock and into Rosario near slack water and were able to work their way up the strait in a nice northerly breeze to begin finishing at 12:15pm but the later it was when you got around Davidson Rock the harder time you had in making the finish. Division 0 began finishing at 2:50pm and the first boat in Division 1 didn’t finish until 4:30pm and the leader in Division 2 finished at 5:06pm! The current was rippin’ out Rosario towards Juan de Fuca as the majority of the fleet worked north towards the finish. The left shore worked great early and boats sailed along Jones to Blakely and then found themselves in everyone’s favorite hole to the North of Blakely island. The later boats made huge gains by sailing across to the right and along Cypress, at times in positive current until cutting across to Lydia Shoals and joining the drifting masses as the sun set and everyone spent the final painful hour trying to get to the finish well inshore of the Lydia Shoal buoy in little to no wind and adverse current. As the clock ran out at 6pm three boats had made it across the line in Division 2 and Martha had the line in site with More Uff Da hot on her tail after working up the Cypress shore and across to the Lydia Shoal buoy. (San Remo, Italy)- Last weekend the final races were sailed to complete the first West Liguria Championships off San Remo— for many, it was the best winter sailing event in northwestern Italy. The regatta saw steady northeast to easterly breezes blowing from 25-30+ knots for both days of racing. The J/70s delivered an extraordinary show of power & performance, sailing upwind against big waves at a very competitive speeds compared with bigger boats in the 35 to 45 ft size range. With such strong upwind performance the J/70’s then hoisted their spinnakers and were literally flying downwind, holding the best breeze and angles, catching the big boats before the end of the downwind leg! What was most impressive was the result of the second day, when the breeze was a little stronger and waves bigger: the small J/70 won “overall” for the day and, as result, finished second in the overall standings! In Group “B” the J/70 was easily leading both days. At the docks after sailing, many sailors came down to look at this little Speedster— all astonished! Many thanks to Gian-Luca Grisoli, a new happy J/70 owner, for his experience in sailing such a wonderful regatta. And, a special and friendly thanks to Beppe Zaoli YCS President for the welcome hospitality to the new J/70 class in San Remo! Xiamen’s Blue Sea Wins J/80 China Match Race! (Xiamen, China)- Who said good sailing didn’t exist in China. 4 Days, 4 umpires, 17 teams, 64 Races, 2 Black Flags, more ‘Y’ Flags, green, blue and yellows than you could shake a stick yet not one Rule 14 infringement and all this with a loss of 2 hours a day on the first 3 days. In one semi-final, on one 800m windward leg, 27 tacks apiece and on the final day 23 knots of wind – more than they can seemingly handle in the America’s Cup. The Club Cup, as it is often known amongst sailors in China, is the oldest keelboat regatta in China and it would be a fair guess that it is the largest (for Chinese sailors), the highest quality, and most respected keel boat regatta in the country. Started as a challenge between two clubs in beat up J-24s almost 10 years ago it pre-dates the more commercial China Cup International Regatta by a couple of years but the biggest difference is that this is a Chinese Regatta for Chinese teams not racing charter for predominantly a bunch of foreigners and the event has grown in size, quality and stature year on year. The speed at which this event has matured both in terms of race management and the skill levels of the competitors is little shy of unbelievable, there is obviously a lot of coaching, practice and perhaps even video watching going on in Chinese sailing circles. In the past it has been run over the week of the Chinese National Holiday, this year the event had to be split into a preliminary fleet racing regatta where the 30 entries were whittled down to 16 who returned to Xiamen 3 weeks later (this past extended weekend) for 4 days of knock-out match racing. This match racing could best be described as competitive with the flags flying almost as much as the spray on the final day yet so often the teams could be seen giving each other the thumbs up and applauding each other as they crossed the finish line with victories that were incredibly frequently not assured until the last 100m of the race track. The first 3 days lost an average of 2 hours per day due to the breeze being, simply put – somewhere else but the team comprising of PRO Kang Peng, Li Li, the “glue” that held the event together, and the umpire team of Jono, Al, Lauren and GG, not forgetting Jim Johnstone who tirelessly fixed breakdowns and handled boat swaps kept the event pretty much on schedule albeit with nav-lights required on the umpire boats for the return to the marina on a couple of days. The semi-finals saw both extremes of weather from 6 knots for the first 2 races to over 25+ kts for the completion of the final matches. Little by little the 16 teams were whittled down to the finalists Xiamen’s Blue Sea YC and Yomovo Sailing Club from Hainan. Each race within this match was won by boat lengths rather than legs and proved to be a hard fought battle to the final finish line. In one pre-start the boats did so many spins round each other than the umpires appeared to be demoted with the umpire flag on their RIB turned from a ‘U’ to a ‘J’. (Think about it)! There were attempts, some more successful than others, to use just about every rule in the book to encourage the umpires to fly the other boats flag but the umpires decisions were accepted in the right spirit with, quite naturally, one or two close decisions having to be talked through on the dock later. There were lead swaps where a runaway leader dropped the kite in the tide allowing the other boat to take over and run away themselves, to races where the protagonists crossed the finish line overlapped as they had been for virtually the whole race. Ultimately it was Xiamen’s Blue Sea SC who prevailed winning the competition to become the challengers to the current holders Liuzhou Sailing Club with the local team from Xiamen Island prevailing 4-1 over the defenders although the scoreline suggests less close racing than reality. So it is all over for another year, and although there may be pretenders to the throne of the Club Cup, certainly as far as match racing is concerned, nothing in China even comes close. Thanks for the contribution from Hong Kong’s Alistair Skinner. (Hamble, England)- After weeks of gales, it was with some trepidation that the Garmin Hamble Winter Series fleet nosed out of the river on Sunday in time for their start. Fears of wintry weather were misplaced, however, and some hours later the fleet returned with grins on their faces. ‘Awesome day on the water’ and ‘Champagne sailing conditions’ were some of the phrases heard bandied around the clubhouse after racing by competitors sporting that most unseasonal of things – sun-kissed faces. The north-west 15-18 kts breeze provided some delightful but testing sailing conditions for the assembled racing yachts, with big shifts offering up big gains for some competitors with their eyes out of the boat and big losses for the less fortunate. One race was sailed. In IRC 0, David & Kirsty Apthorp’s J/111 J-DREAM continued to sail a consistent series in their class and maintained their strong record with a 2nd this past weekend to hold on to their bronze podium position as well as their gold position in the J/111 one-design class overall. In IRC 2, Paul Heys’s J/88 JUNGLE DRUM won class for the second time in the series and Louise Makin’s J/105 JOURNEYMAKER took fifth. Nick Munday’s J/97 INDULJENCE won their fifth race in IRC 3 Class to take a commanding lead overall. Just behind them is David Greenhalgh’s J/92 J-RONIMO lying in fourth overall. (London, England)- Over 500 delegates from more than 60 nations gathered together in Muscat, Sultanate of Oman for the 2013 ISAF Annual Conference. Held from 9-16 November, the ISAF Council made decisions that affected the sport of sailing in the immediate future. Most importantly, the J/70 one-design class was awarded “International Class” status. As one looks back on the history of one-design classes that have achieved International Class status with ISAF (and its precursors like International Yacht Racing Union), never has a boat from any nation achieved “international” status in less than eighteen (18) months from its initial commercial introduction to the world’s marketplace. There are not as many racing sailors out there as I thought there were. Much has been said about the decline in sailboat racing so that is no secret, but it dawned on me recently that it is worse than I had thought. When I was sailing 36 foot racer-cruisers, we usually sailed with and against people we knew from year to year, even as we moved around. And those people normally stayed with the same crew, or maybe switched from one boat to another within the same fleet. Now that I sail mostly on J/70s we travel a lot more and are exposed to a much larger pool of sailors, many of whom I did not previously know. So I pay a lot more attention to the other sailors in our fleet, who they are, where they sail, their backgrounds, etc. I want to meet new sailors, follow their accomplishments and hopefully learn from them. What I have found is that many of these people sail in a variety of boat designs, not just in one class. They may have a favorite but they can be found in different boats in different events, sometimes driving, sometimes crewing. Where I am going with this is that if you name four different fleets of say small keelboat one designs you don’t have four distinct sets of sailors. Many of the names sail in multiple fleets, so the total number of participants is less than you would first think. I figured this out by looking at the results of the J/70 class at first, then scouring the results of other classes….and the same familiar names cropped up on scoresheets all over the place. Some of these people sail Melges 20s, Melges 24s, J/80s, Lightnings, J/22s, J/24s, etc. in addition to the J/70, often 3 or 4 different classes. This is not a bad thing at all; it means that sailors get to try and enjoy different boats (there is no perfect boat) and meet more people as they move around. But it can give the impression that there are a greater number of sailors than is actually the case. Each class is thus in somewhat of a precarious position. With sailors hopping from class to class they might not have the long term commitment to any one, so any given class could find itself with a drop in attendance at any time. The exception to this would be those classes that focus their energy on sustaining membership based on a collegial atmosphere, involvement at a social level, being inclusive of sailors of varying ages and abilities, etc. (San Francisco, CA)- This past weekend the St Francis Yacht Club hosted the first stop of the three event 2013-2014 California Dreaming Match Racing Series using its fleet of identical one-design J-22s. Despite delays each morning for the wind to fill in, typical for off-season on SF Bay, the RC managed to complete 11 flights for the eight teams. First overall went to local San Francisco Bay favorite Russ Silvestri and his team of Mario Yovkov, Erica Mattson, and John Collins, who scored 5.5 points. Second with 4.5 points went to past winner and fellow St. Francis YC member Nicole Breault and her team, followed by a three-way tie among skippers Shawn Bennett (St. Francis YC), Dusty Durant (Long Beach YC) and Jimmy Barnash (Rochester YC) just a half point back. J/105 LOKI Surfs Nassau Cup! (Nassau, Bahamas)- The famous SORC Nassau Cup Race took place this past weekend in what many would’ve considered “champagne sailing” conditions for their “hang ten” ride surfing the big waves across the Gulf Stream to Nassau, Bahamas. Unlike what was expected for the start and very d issimilar to the previous couple of days, all the PHRF class started on time and under beautiful blue skies at 1105 hours Saturday morning. The winds were out of the North at 10-12 knots and the forecast showed a pretty large front that would power the fleet home in near record time. After the teams had awoken to gorgeous sunny skies for their finish off the majestic Nassau Harbor Lighthouse, they immediately headed to “Race Central HQ” at Nassau YC for the warm greetings and legendary (e.g. amazing!) Bahamian hospitality. Enjoying it more than most may have been David Bond’s J/105 LOKI, taking third Overall and again placing on t he podium for at least the past three years! Congratulations to the LOKI team for their perseverance and happy times had by all. J/Teams Blast Around Hong Kong Islands! 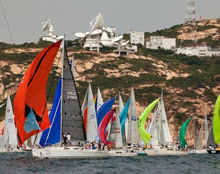 (Hong Kong, China)- Hong Kong's largest and most inclusive sailing event, the Tommy Bahamas Around Island Race, featured more than 200 sailing boats, together with outrigger canoes and coastal rowing boats. All teams battled it out over the 26nm course that is known as the “Round Island Race” (e.g. all around the islands that comprise Hong Kong)! Cool race, spectacular vistas of the world-renown city and breathtaking views of the ginormous, lush, jungle green mountain-tops. Anyone looking out of their window in Hung Hom or Chai Wan on the morning of the start would see hundreds of boats converging on Hong Kong’s Victoria Harbour from every point of the compass for Hong Kong’s biggest annual celebration of sail and paddle on the water. The Around the Island Race became an annual event in 1983, however its origins go back to 1864 when six boats raced around Hong Kong Island to Starboard (clockwise) and Hong Kong’s sailors have since regarded this route as a tricky challenge with unpredictable wind shifts. The race course features a 26nm circumnavigation of Hong Kong Island to starboard, which has been sanctioned by Hong Kong Marine Department since 2003. This year there was record-setting breeze, so the Royal Hong Kong YC PRO, Ms Inge Strompf-Jepsen, managed to fire off twenty separate starts for sailboats at RHKYC’s Kellett Island clubhouse. With the replenishment of the northeast monsoon filling in overnight, many competitors took one look at the conditions and decided that prudence was the better part of valor. This included the majority of the beach cat classes, where even the most battle hardened sailors took one look at the conditions whipped up by the 15-18kt easterly in the harbour and decided that the 25kts plus and two to three metre seas at Cape D’Aguilar were not for them or their boats. With 258 entries, this was the biggest prospective fleet recorded for the 26nm circumnavigation. With even Cyberport Gate getting a good 20-25kt blow and the relatively flat stretch along the south and south west of Hong Kong Island meant the entire fleet would likely be on record-setting paces for their respective classes. Indeed, after the finish times were recorded and handicap times applied, it was pretty clear that most records fell from previous years. Amongst the J/Teams, there were some excellent performances. In the highly competitive IRC 2 Class, the J/111 MOJITO sailed by Simon Blore had a tremendous race, taking second overall and narrowly missing the overall win by a mere minute and a half! Taking a comfortable fifth overall in the IRC Cruiser class (white sails) was the super quick carbon flyer, the J/145 REDEYE skippered by George Taylor. In the HKPN 601-910 class, the J/109 WHISKEY JACK sailed by veteran Hong Kong offshore campaigner Nick Southward, managed to pull off a third in their class in the challenging breezes. Still savoring their classic J/35 NO ONE ELSE was Emily Chan & Sidney Leung, skippering the boat to a third overall in one of the largest classes in the race- HKPN 981-1070 class. 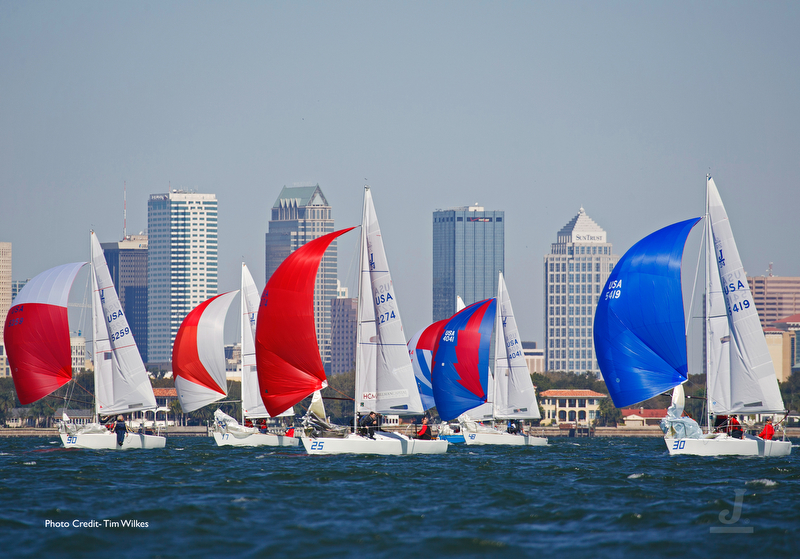 (Coconut Grove, Fl)- Coral Reef Yacht Club and J/24 Fleet 10 would like to welcome the J/24 Class to the beautiful waters of Biscayne Bay in Coconut Grove, Florida for the 2014 J/24 Midwinter Championship Regatta- being held from February 19th- 23rd, 2014. The committees are working on finalizing details for local housing with club and fleet members as well as finding the best hotel rates in the surrounding area and we will be posting that information soon. Also be looking for some entertaining stories from past Midwinter Regattas at CRYC in the 80's and 90's like.... “Do you know where the Black Flag came from”? Look forward to future news to find the answer and expect to see the original version of the Black Flag on the 2014 starting line after the first general recall (that is, if you don’t behave)! And, some of our most entertaining TV sailing personalities of today (think AC Cup recently) got their start sailing J/24's in the 80's on Biscayne Bay ... there are stories to be told! Oh, those were the days! (Key West, FL)- The annual winter pilgrimage to the sunny, friendly climate of the Florida Keys in late January is showing healthy participation by J/Sailors! This spectacular event presents world-class competition over five full race days. 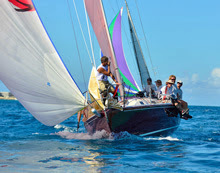 Entering its 27th year, Race Week offers exceptional racing and fun shoreside parties in wonderful Key West. The Florida Keys and Key West are the perfect southernmost vacation destination! Yes, even the first J/24 Midwinters sailors in 1978 can attest to that fact!! Premiere Racing’s reputation for excellent race management and regatta organization promises to deliver another great regatta and ideal winter get-away for all sailing enthusiasts. If you haven’t already, make plans now to start off the New Year with the best sailing there is this side of the Caribbean’s aquamarine waters and warm, gentle trade-winds. So far, 105 boats have signed up for Key West, with the two largest one-design fleets being J’s. The 64 J/Teams registered in four classes represent 61% of the fleet, a veritable J/Fest down in the Florida Keys! By far the largest one-design fleet at the event, the forty strong J/70 Midwinter Championship fleet, already has representation from the USA, Canada, Mexico, Bermuda, Great Britain and continental Europe. The next biggest fleet are the fourteen J/80’s competing for their 2014 Midwinter Championship with several of their top teams participating from across the country. Hamburgers Masters Of J/70 Segel-Bundesliga! (Berlin, Germany)- What began as a dream and passion to grow sailing across Germany became, for even the most diehard detractors, one of the most successful sailing projects ever launched in European sailing history. Some may point to the Extreme 40 catamaran sailing series or RC-44 one-design series as examples of how to grow participation in sailing amongst the elite of the sailing world. However, no one has demonstrated, until this year, how to grow sailing at a grass-roots level that was “all-inclusive” and fun! Perhaps more importantly, make it a remarkable learning experience with many of Europe’s best sailors participating (e.g. Olympic Medallists and World Champions) and get everyone cheering enthusiastically for their respective sailing clubs to win! That was the secret of the inaugural J/70 Deutsche Segel-Bundesliga sailing series held in five locations across Germany this past summer. The exciting conclusion of the series on Berlin’s Wansee saw a bunch of northern “Hamburgers” trounce their “southern” friends from Berlin and points south in Germany. And in the end, the eighteen sailing clubs/ yacht clubs and hundreds of sailors that participated from across Germany were all the real winners; each club saw tremendous interest grow in the event all summer long with many wishing to participate the next time around! The finale on the Wansee took place in about as picturesque and dramatic a city lake-front as anyone could imagine. It served as tremendous theater for the finalists to battle for not just the Berliner regatta honors, but the overall series honors as well. The Berlin/ Wansee regatta saw tough competition, especially from the host club sailors that demonstrated excellent local knowledge of the tricky wind conditions. Indeed, the first two places went to the locals, with the Schweriner YC team comprised of Ingo Koehn, Torsten Haverland, Lars Haverland and Uwe Thielemann winning an impressive series with seven finishes in the top three! They were followed by their colleagues at Verein Seglerhaus am Wansee with the team of Malte Kamrath, Ulrike Schumann, Frithjof Kleen and Nils Schröder. Taking third was Lindauer Segler-Club, fourth was Norddeutscher Regatta Verein and fifth was Muhlenberger Segel-Club. Behind NRV in the overall standings and taking second prize for the series were the Wurttembergischer YC team. While sailing fast and smart in Tutzing (4th), Travemunde (5th) and Friedrichshafen (1st), their team members didn’t quite hit the ground running in championship form in Hamburg (7th) and in the Berliner finale (9th). The biggest battle happened to be for the final position on the podium for the series with at least four teams vying for the coveted bronze medal. By sailing their hearts out in Berlin, the local favorites (Verein Seglerhaus am Wansee with skipper Malte Kamrath), rode their second place onto podium by a whisker! The VSaW team started the series slowly in Tutzing, but closed with a flourish at Friedrichshafen (2nd) and Berlin (2nd) to claim the bronze for the overall series. The balance of the top five were quite close, finishing just two and three points behind VSaW, respectively. After starting the series quite strongly - Tutzing (1st), Travemunde (3rd), Hamburg (3rd)- the proverbial “wheels fell of the silverware shopping trolley” for YC Berlin-Grunau’s team. The last two events for YC B-G were tough pills to swallow, having to count the Friedrichshafen (9th) and Berlin (12th) to finish fourth. Just one point back was the very consistent team from Chiemsee YC, counting a Hamburg (2nd), a 5th and three 6th places to hang in for fifth overall. After five months, it is quite clear the concept of the first Deutsche Segel-Bundesliga has been a great success. The acceptance of the first nation-wide club competition in Germany is very high amongst the sailing community. The five events that were held in the first year were dominated by local patriotism, passion, camaraderie and fairness between the sailors. So far, there are now more than 30 other clubs that are interested in participating for the 2014 sailing season! Many happy memories were recorded for all of the sailors, the organizers, sponsors and the host clubs. Below are the links to the photos and some nice sailing videos for each one of the events. (Friedrichshafen, Lake Constance- Austria, Germany, Switzerland)- The “Bodensee” as Lake Constance is known in central Europe is perhaps one of the most remarkable bodies of water in the world. Steeped in history and at the middle of a “tug-of-war” between various empires over time in the middle of Europe, today “the lake” enjoys a somewhat neutral position in the world of politics and empires— no one has jurisdiction over the sailors whom enjoy its spectacular sailing venues— be that Austria, Switzerland or Germany! As a result of its unique place in history, Lake Constance has a remarkably collaborative approach to life on how one manages one of the most beautiful lakes in the world! With no jurisdictional powers over the lake, three major European nations exercise their “community of interests” by cooperating together on a wide variety of sailing, environmental and social issues. In this case, summer, fun, beaches, sun-bathing, boating and sailing are the principals that drive all towards a common interest to enjoy a shared passion for the water! In a remarkable development over the course of the past year, for the first time Germany and an entire region of central European sailors have made a decision to promote a single class within their clubs and throughout the entire region! The project initiated from Constance sailor Christian Rau, an experienced European one-design racer. Together with other successful sailors from the racing scene at Lake Constance, they developed a concept that could be the basis for the development of a relatively inexpensive and fast boat, which could be promoted by all of the clubs and, most importantly, could be leaders in developing a new EUROPEAN-wide one-design keelboat class! The Lake Constance Sailing Association is planning to organize five main one-design events on the lake for the 2014 summer sailing season. In addition, they will also take part at seven other main events on the lake. As a result, new J/70 one-design sailors will have at least twelve regattas to sail next summer on the Bodensee! 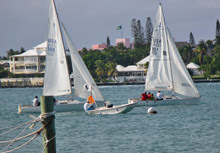 Most importantly, everyone (community sailing club or private yacht club) can take part at all events. Henning’s Mittelman’s Werft team will be providing a fun “twist” to the series, providing a “Golden Spinnaker” to the current series leader for each event— so everybody will be able to see which boat is leading the overall score going into each event! For more German J/70 Class Association information (just recently organized). 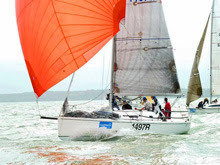 For more J/70 & Lake Constance Sailing Association sailing class information. (Lima, Peru)- Since July 2012, the J/111 CHALLWA (means “fisherman” in the native Peruvian language), has being sailing and racing in Peru’s and Ecuador’s offshore racing circuits under the ORC handicap rule. Their latest event, the Copa del Pacifico Regatta, belongs to a series of races between Peru and Ecuador that is held annually. This particular event is sailed in Paracas Bay 150 miles south of Lima- the capital of Peru. German Fuchs, sailing aboard CHALLWA, reports the following about their experiences in this year’s Copa del Pacifico: “We had a series of eight windward-leeward races and two offshore- one of 32nm and the other 28nm. The fleet was quite competitive with teams from Peru, Chile and Ecuador. We sailed in ORC Class A against a new Soto 48R, Sydney 46, Swan 45R, two Grand Soleil 42R’s and a Soto 42R. Most of our races were sailed in 15-20 kts TWS, except one W/L was sailed in 6kts TWS. Our best results on the J111 were in light winds and running or reaching in 16-22 kts TWS. For this regatta we opted to set a bigger spinnaker of 157sqm instead of the J/111 one-design class size of 130sqm. This change for ORC handicap racing gave us very good results in light winds and we were able to get the boat into “planing-mode” (like the J/70) in just 16 kts TWS for best VMG downwind! In fact, we reached average 15kts boat speed with just 22kts TWS running downwind- this monster kite cost us only 1 sec/mi in GPH, that is nothing compared with the benefits gained! (Baltic Sea, Germany)- The Piranha Department of Autobahn Speed presents its latest small cruise of the season 2013. Crazy Germans are we?! You bet. We LOVE sailing as fast as we can drive our cars (your basic Porsche, BMW or Mercedes) down the Autobahn in Germany, especially in the sinuous, windy curves of the famous Black Forest. Nevertheless, we digress! Recently, we had the opportunity to hop aboard the PIRANHA and take here “for a cruise” in the Baltic Sea, just your cool breeze howling out of the Northeast with 1-2.5 meter breaking waves and winds around 7 m/sec— really just your average small gale. It was a spectacular day of sailing for the PIRANHA crew! Record speed: 22.64 knots!! Yah! We are still learning how to sail this speedster faster. Any tips for us?? Please see our J/111 PIRANHA website to contact us. Here’s the sailing video of the J/111 PIRANHA on “cruise-control” in the Baltic Sea. J/24- The Grad School For World Championship Sailors? (Portsmouth, RI)- Ask Will Harris from Waterline Systems. Says Will, “In some circles, it’s cool to trash the J/24 “because it is hard”. Yep, it’s hard all right. It’s supposed to be. With 35 years of tuning guides written by the likes of Dave Curtis, Vince Brun, Kenny Read, Terry Hutchinson, Ed Baird, Mark Ploch and Tim Healy, everyone can get the boat set up right. From there, it just boils down to sailing really, really well. Tacking the genoa is hard, but the guy next to you is going to tack it perfectly. Getting five guys all in synch on maneuvers is hard; but again, the guy next to you is doing it. Crawling under the boom on tacks is kinda hard, but if I can do it- well just shut up. It is no wonder the J/24 class has been the starting point for many sailors getting to the ISAF and US Sailing Hall of Fame! Racing this past summer at the J/24 North Americans was a great reminder of the value of this class. When Mike Marshall of North Sails asked me to sail with him in the Newport event, I jumped at the chance. I was particularly psyched because I’d get to sail with a bunch of young guys – some of whom were not alive when I won my first NA’s. Mike, Tom King, and Mike Nicoletti are all in their 20s, while Nick Sertl was playing hooky from high school to sail the event. Me – well let’s not talk about my five decades on Planet Earth— doh! If I had to choose one word to describe a high level J/24 regatta, I’d suggest “relentless”. If you make any little mistake, you lose boats – every time. A bad start puts you in the “wayback” and the guys in front aren’t making mistakes. Even when you are way back, you can’t give up. Even the best guys are having those kinds of races occasionally. Every boat you can claw back is going to make a big difference in the point total at the end. It is truly a game of inches in this class. If you are looking for an easy class to jump into and win with minimum effort, then I’d suggest that the J/24 class might not be your best choice. You’ll get killed! Try a Viper, Melges 20 or some other “easy” class. Sailors, Middies and “What Does the Fox Say”?! (Annapolis, MD)- So, who is it to say that talent can’t be developed from the most remarkably goofy and crazy places amongst our friends and families around the world? OK, well not exactly AMERICAN IDOL, this crew at the US Naval Academy (along with help from their USNA Sailing Team) certainly have sufficient creative and innovative production capabilities to pull off one of the better take-offs from the wildly popular, remarkably viral, “music video” known worldwide as “What does the fox say”. For your weekend amusement, you have to see the original and the US Naval Academy “derivative” music video— perhaps one of the best “take-offs” ever (other than an F-18 catapult off a US Navy nuclear aircraft carrier!!). The original Finland production of “What Does the Fox Say”? The US Naval Academy Un-Official Sailor Middies Production (Editor’s Note- we do not know anyone in this video). Bitter End YC Pro-Am Sailing Was Awesome! (Bitter End YC, British Virgin Islands)- Back to Work on North Sound? “The 11th Annual Scuttlebutt Sailing Club Championship, sponsored by GILL at the Bitter End Yacht Club, was just about as good as it gets in this sport we all love so much. Immodest? Of course, but methinks few (if any) would disagree,” said Scuttlebutt founder Tom Leweck (long-time J/Boats sailor). After enjoying a layday on Wednesday, it was ”back to work” today on the North Sound. Five double sausage races were sailed in rock-solid Caribbean trade-wind conditions in five perfectly matched IC-24s (modified J/24s) – the same boats used for the BEYC’s Pro Am Regatta. The five skippers were BEYC resort guests who came to the BVI to crew for the rock star skippers in the Pro Am Regatta. This was their turn to shine. Each had qualified earlier in the week by racing Hobie Waves, Hobie Escapes, and Lasers. The competition could not have been closer. After five races, the championship was decided by less than half a boat length. Defending Champion, I-14 sailor Ron Boehm from the Santa Barbara Yacht Club in California, nicked former Scuttlebutt Sailing Club Champion George Huntington, from New York’s Manhasset Bay Yacht Club, by a single point. Both Ryan Raber and John Paul Bilodeau from Maine’s Portland Yacht Club had qualified for the championship, but elected to team up and race an IC24 together. They finished in third place. Earlier in the day the pros completed their final four Pro Am fleet races with the BEYC guests rotating through the crew spots on their boats. Match racing for the championship, based on the fleet racing standings, that began on Friday. In spite of the fact that Alec Anderson had been named as a collegiate All-American in 2011, in 2012, and in 2013, many of the resort guests arriving at the Bitter End Yacht Club for the Pro Am Regatta were not familiar with his name. Well – they all know him now. Anderson has just become the BEYC’s 2013 Pro Am Champion. Racing in a matched fleet of IC24s with guests of the BEYC rotating in and out of the crews of the eight invited pro skippers, Anderson took second place in the 12-race fleet racing qualifier – just four points behind former Olympic Silver Medallist Zach Railey. That was more than good enough to move him into the four-boat Semi Finals, where the format switched to match racing. The recent graduate of sailing powerhouse Roger Williams University from Rhode Island had not done a lot of match racing in college, but was a quick study. In two very close races against Dave Ullman, he went 2-0, and advanced to the Finals. Now, the only thing standing between him and the championship was match race expert Dave Perry, who had just dispatched the fleet race winner Zach Riley, 2-1. Once again, Anderson was flawless – defeating Perry 2-0 to become the youngest-ever Pro Am Champion. Perry had to settle for second place with Zach Railey capturing third by defeating Dave Ullman 2-0 in the Petit Finals. In the consultation round of match racing, Paul Cayard was 2-0 against Stephanie Roble to finish fifth overall. What’s next for Anderson? He recently teamed with Chris Brockbank to campaign a 49er with hopes of representing the BVI in the 2016 Olympics in Rio. Remember the name Alec Anderson. No doubt you’ll hear it again. Pro Am Facebook group. Bitter End YC sailing website. Parker Wins J/24 East Coast Championship! (Annapolis, MD)- The 35th annual Hillman Focused Advantage Fund J24 East Coast Championship was held on November 1-3, 2013 in Annapolis MD and hosted by Fleet 8 Annapolis and Severn Sailing Association. The three day event saw an unpredictable forecast, breezes between 5 and 20 knots, 30 degree shifts and tricky conditions that left most of the 31 boat fleet scratching their heads. But in the end it was Tony Parker’s BANGOR PACKET with a daily score of 2, 2, and 1 on the last day for a total of 17 points that won the regatta and anointed him as the 2013 Hillman Focused Advantage Fund J24 East Coast Champion. Tony has sailed all 35 J/24 East Coasts and it is his third win. Tony also won Top Amateur for the event, beating out many top names in the class. Will Welles on COUGAR took second place with a total of 24 points. Travis Odenbach on HONEY BADGER finished in third with 39 points. Mike Ingham on USA 5443 finished in fourth with 43 points and Ron Medlin Jr. on BASH had a very nice event rounding out the top five with 47 points. Day 1 began with 40 kts of breeze from the west and a driving rain which forced an hour and a half on-shore postponement. The weather pushed thru and the 31 boats headed out on water to what was to be a predicted 25 kts breeze. The fleet however was met with 10 kts of breeze from the south and a strong tide flood up the bay. Race 1 had sailors deciding whether to go right for tide relief or left for more pressure. With a split fleet, it was the left that won out. Downwind was tricky with a dying breeze but it was John Wilsey on Panceta Doble working the left on both beats that won the first race. Race 2 saw the wind die even more. 5 kts wind, with a 1 kt current made it for another tricky first beat where getting out to the right and out of adverse current seemed to be the key. However a big left shift change that strategy. By the end of the first run, the wind had died to just a few knots and once rounding the crowded gate, everyone could barely make progress against the tide. But sailing fast and consistent through all that was Al Constance in Blitz taking the win. Principal Race Officer Juliet Thompson wisely sent everyone back to the docks where sailors were met by the two-time National Oyster Shucking Champion George Hastings and his fresh Virginia blue point oysters, along with homemade Maryland crab soup made by Bill, and Pat Fitzgerald and the crew of Rush Hour and a wide variety of fresh beers on tap. Day 2 saw another decent forecast of 15 kts from the north never materialize and leaving no wind and no races. The thermal which tried to make its way filled in too little too late. Fortunately there was a Dark and Stormy Rum party with home-brewed ginger beer and a buffet dinner of pork loin, Jamaican jerk chicken and Cuban black beans and rice catered by SSA’s own John Miller and Real Food, LLC. Dinner was accompanied by the previous day’s daily awards and the raffle featuring a J24 skirted deck cover sponsored by North Sails One Design. 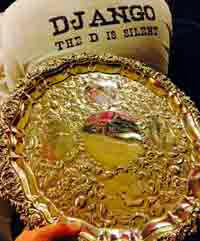 J/24 DJANGO Knighted With “Rinevella Plate”! First won in 1832 by the Knight of Glin, the coveted Rinevella Plate has become a much sought after prize amongst the sailing community on the West Coast of Ireland and its pride of place remains at the County Limerick Castle. Hand crafted from Limerick silver, the plate depicts the many historic elements associated with maritime traditions on the Shannon Estuary and right up the west coast. The Rinevella Plate, which resides on the dining room sideboard at Glin Castle, was first won by the then Knight of Glin at the Galway Regatta when the family commissioned the unique piece for a once-off regatta. 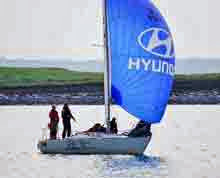 Given to the then Galway Yacht club as prize for the winner, the winning boat owner staked their claim on the piece as the family sought to increase interest and participation on Irish waterways. Like many years before, the Royal Western Yacht Club of Ireland hosted the October series to determine the winner of the priceless Plate cast in Limerick silver. More importantly, the competition lived up to its history and its roots! The “DJANGO Hyundai Ireland” J/24 team sailed their mighty yacht for the Rinevella Plate and took the overall title this year after winning the IRC Class 1 over the series of six races! Crewed by Martin MacNamara, Thomas Whelan, Andrew Carey, Charlie Glynn and Diarmuid Whelan, the 2013 winners said they were honoured to take the title amongst stiff competition. Limerick boats from Foynes YC, together with Disaray sailing out of Tralee Bay Sailing Club, and Kilrush-based yachts made up the tough competition to decide the winners of this year’s historic plate regatta. Needless to say, “good times” were had by all after raising a multitude of toasts to all over several dozen pints of the best ales from County Limerick! San Diego YC Crowned Lipton Cup Champions! J/111 Gone Fishin' in Middle Sea Race?! J/Sailors Sailing a "Green Project" @ 11th Hour! J/109 WHISKEY JACK Takes China Cup By A Whisker! “The Commodores” Crowned Masters of the Universe! J/Sailors Enjoying Gunboat catamarans, too! J/120s Lead Harvest Moon Fleet Home!